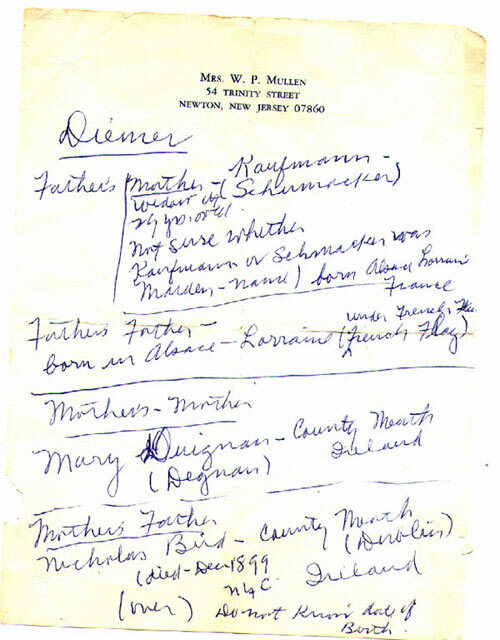 My grandmother Mullen moved into our house, in Newton, when I was six years old. She died in 1984, aged 94 years. It was most unusual for someone of my generation to have grown up with the daughter of a Civil war veteran. 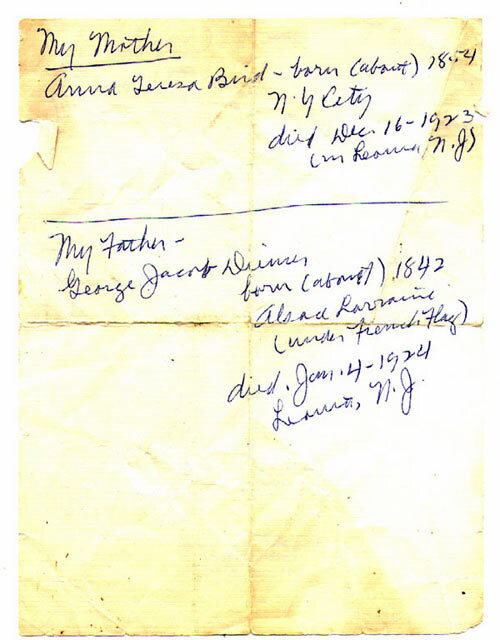 Her father George Jacob Diemer was 46 years old when he was married to Anna Bird in 1886 and my grandmother was born four years later in 1890. She used to tell how he had been at the Battle of Chancellorsville when General Stonewall Jackson suddenly outflanked the Union Army and sent them retreating northward. He got stuck in the mud and, at a friends urgent appeal, he had to abandon one boot in the thick mud to escape capture. for the rest of his days, whenever this friend got mad at him, he would always say, I wish Id left you in the mud at Chancellorsville. He also fought in the Peach Orchard at Gettysburg. He had a toe blown off in the Siege at Petersburg, Virginia, and after recovering in an army field hospital, was sent home. My grandmother Mullen lived in a two-room apartment on the first floor of our house on Trinity Street. She had a bed in her living room, with a TV and a big stereo record player. Her kitchen and bathroom were in the adjoining room. The three older boys, including myself, moved downstairs into an adjoining bedroom and so she would prepare our breakfast and lunch before we went to school. We usually had a soft-boiled egg in an egg cup and a cup of tea. She almost died of a broken heart when her youngest son, Johnny, was killed in Korea in 1953. My brother Tim was born on January 27, 1953, and she always said that God gave Johnny back to her with Tim  he even looked like Johnny. I remember going to Christmas Midnight Mass when Tim sang Oh, Holy Night. We were seated in the pews below the choir loft and my grandmother kept straining her neck to catch a glimpse of him singing in this angelic voice. 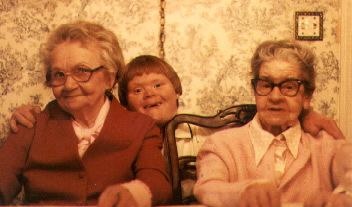 Grandma was quite hardy and very worrisome. She hardly stood five feet tall. She also loved hats and love to trim her hats. She also loved to read. She adjusted to changing times very well. We were down at a beach cottage in Manasquan when the Neil Armstrong stepped out onto the Moon. She was in the kitchen, making a cup of tea. When we called for her to come and watch, she said, rather non-chalantly, that shes seen a lotta changes in her life. In fact, she once told me that her first memory  as a little girl living in New York City  was a horse-drawn fire engine rushing down the street. Apparently, the horse slipped and injured its leg on the icy cobble stones, so the firemen unhitched it and pulled the apparatus to the fire with their own muscle power. They later returned and had to shoot the horse. When I was in high school, my father made part of our split-level living room upstairs into a bedroom for her. When I was home from college, you could hear her coming down the front stairs to the new kitchen on the ground floor. We used to hold our breath it would take her so long and each step seemed so labored. But she always made it. We took her on our vacation to the shore in August 1983 and she even made it out onto the beach in her big sun bonnet. When we returned to Newton, she was standing at the refrigerator, getting some milk for her tea, when her hip snapped and she crumpled to the floor. She had it repaired but never really became fully ambulatory again. At that time, I gave her a blank book and asked her to write down something about her life. The result is as follows. To begin with, my mother Anna Teresa Bird and father George Jacob Diemer were married in New York City on December 3, 1886. My brother George Charles Diemer was born December 8, 1886, on Vestry Street, New York city. asnother boy, Edwin, was born in 1888. He died in infancy. 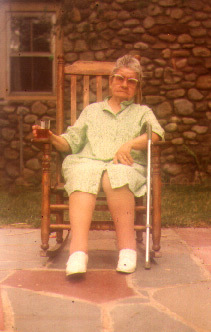 I, Mary Genevieve Diemer, was born October 19, 1890. 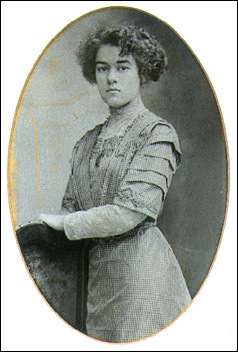 Another girl, Emma, was born in 1892. She too died of summer complaint sometime in the early 90s. My parents moved to 326/328 West 36th Street as caretakers of these buildings. When my parents were married, my father worked for the Old Dominion Steam Ship Company (whose produce was unloaded at the pier there). My father continued to work for the Old Dominion Steam Ship Company until I believe the early 10s. He received a small pension from them. To go back  my father was born in 1840. My mother was born in 1854. My father was born in Alsace-Lorraine, france. He came to America when he was about 6 or 7 years old, with his borther Mike (I dont know who was the older) and his sister emma. His father died and his mother remarried and some Diemer cousins took care of the three of them. When my father reached 16 years old he enlisted in the Civil war (as a water carrier for the horses in the cavalry). He served full time and for the remainder of his life received a Pension. My father just had this Uncle Mike who came over with him and his sister Emma. He worked up until about 10 years before he died at 82 years old. Maybe he was younger; I dont remember when he retired. It seems to me, my grandfather Bird was a bit of a perfectionist, very strict. My mother had four brothers  John, Tom, James and Philip  and one sister, Mary. My mother was the oldest. Her brother John died shortly after my mothers marriage. My mother, as a matter of fact, didnt tell her father before she married or he would not have let her stay at home so she did not take up house for three months. Her brother Tom and sister Mary also married and my mother stayed home until the younger brothers were more or less able to take care of themselves and then moved to Vestry Street, where their apartment was. When I was about two years old  as I told you  my folks moved to 36th Street in New York City. To tell you how hard they both worked, my father worked nights at the Old Dominion Steam Ship Cmpany and in the morning hed take garbage or ashes from the tenants. There was a dumb waiter and there were tubes connected to each apartment and hed call up and the tenant would put their trash on a shelf and father would empty it into large ash cans (returning the receptacles that the tenants sent the stuff in). Then hed roll barrels out to the top of teh street and a regular truck would pick it up. There was a furnace in the building, and in the winter the heat was only given to the Main Hall of teh apartment buildings. The tenants had large coal stoves in their apartments. When he was home, my father would also look aftera pump which supplied water to the top two floors of each building. My mother did it when it when Dad was working days. There was some sort of a wire in an entry way between the two houses that told you if the water was low. 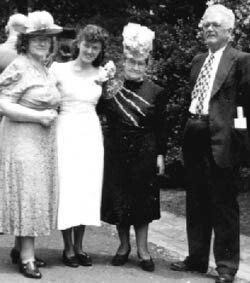 In 1895 my sister Irene was born and a few years later my Aunt Mary and her family moved uptown  a few blocks from us. Her husband had died and she had just had her last child. My mother took the family after their mothers death to live with us. The baby was about four or five years old and my brother and I would take him to nursery school in the morning, on our way to school, and pick him up at lunch time. After the other children grew to manhood and their sister became a nice young woman, the sister took an apartment and the family went with her. Then, my mother took her father to live with us. I loved him  he taught me many things (one was to sing Irish songs) and he stayed with us until he died in 1898 when he was 78 years old. My brother and I went to Public Schools (there were no mixed schools, only boys and girls  no boys and girls in the same school). It was a nice New York City then and I loved it. I remember riding in the Horse Car, then the Trolley (with an overhead wire, then without the wire  I guess it was electric). Also when we went meeting friends in New Jersey we would take a carriage with a fringe on top, driven by horses. In 1915, when my mother became tired of all the chores as she was getting up in years, we moved uptown in New York City to 125th Street and 8th Avenue. We only stayed there a short while. I had graduated from elementary school and started High School, but I did not like it when we moved back to the West Side again. I went to a Secretarial School, learning Typing, Shorthand, and English, and graduated. I went to work on the elevated Railroad to 44th Street between 5th and 6th Avenues, afterwards getting a pretty good job in the American Tobacco Company as assistant to a lady secretary, where I stayed until I was married. My brother worked for teh New York Herald at 34th Street and when we moved uptown, he transferred to the Heralds uptown office. He wa smarried in June 1911 to Estelle Davey. Their son George was born March 23, 1912. After my brothers marriage, we moved again to 262 West 122 Street, near Morningside Park. I continued working at teh American Tobacco Company. My sister Irene was working too, having finished Secretarial School, and she took my place (at the job I worked at 44th Street before going to the American Tobacco Company). We went on vacation together in the Catskill Mountains, where we met a cousin of the Mullens (who remembered us from 36th Street). This cousin relayed word got back that this cousin had met us and immediately my sister started writing to Will Mullens sister May. One day our bell rang and Will came up to inquire about hsi relative who stayed at the same house we were staying in. No more was heard from the Mullens until this cousin died at that Mountain Resort. Will came around again and told us he had taken the body of his relative back to New York City for Burial. After that, Will and myself started going together and did so until we married. We had an apartemnt all furnished in the Bronx, near Wills sister May (who had married before us). When we were married nearly a year, the firm Will worked for transferred to Rochester. Since I was expecting my first child (Bill Mullen), we decided to put our furniture in storage and that Will should go to Rochester. He came every weekend. I stayed with my parents awaiting the birth. When Bill was three months old, I went to live in Rochester with friends of Wills, who had a big house and only two people, a husband and a wife, living there. Of course we paid rent. Naturally I was lonesome but was glad we were together again. Not too long after moving there, Will cam ehome one lunch hour and said Get ready, we are going back to New York City! I nearly died  I was so happy to go back again. We took some furniture out of storage and got an apartment three blocks away from my mother, father and sister. Not too long after that, my mother had her first stroke. My father and sister worried about her being alone during the day. My mother suggested that the rent she and I were paying for separate apartements, we could take a lovely seven or eight room apartment across from Morningside Park, which we did. My mother improved considerably and we got along O. K. We had the piano there and for the first time we head Steam Heat and a telephone and a really nice home. In 1919 my daughter Irene was born on my Birthday, October 19th. When Irene was a year old, my father would sit with me outside Morningside Park with Irene in the carriage. Billy was going on three. He dcided to take a run through the Park, with my Father running after him. when they came back, my Fathers face was so red that I got frightened. Needless to say, we didnt sit there at the Park any more. One day, the great French Marshall Foch went through our street, that is, 122nd Street near Morningside Park. My Dad was standing at the window and he saluted him. As I told you, my Dad was born in Alsace-Lorraine, France. A list of changes since my time: there were no Supermarkets; one store carried only eggs, Butter, etc. Then there were the family Bakers  bread, pies, cakes, cookies; next the Butcher Shop, naturally with meats, chicken, beef, lamb and sometimes fresh fish. There were Drug STores, Small Departmen t Stores, for dress goods by the yard, trimmings and various buttons, etc. After a while A & P had a Big Store with a large Coffee Grinder (coffee beans were sold by the pound and would be ground at the store). This store was the beginning of Grocery Stores, whe?e Bread, Butter, eggs, Flour, etc, were sold, plus a stand outside the store where fruits, potatoes, lettuce, tomatoes, etc., were sold. Milk was also sold, if you bought a pitcher. It was served from a Big Milk Can. The corner Drug Store where prescriptions were filled, also sold package candy and newspapers. One could sit at the counter and get an ice cream soda or buy some penny candy at an Ice Cream Store. My sister-in-law May lived around the corner on Morningside Park and we always seemed to live near each other all our lives. A sister-in-law of Mays had just moved to Leonia. My mother was interested and thought it would be better for Billy, so we moved to Leonia in September 1920 to a two-family stucco house. My brother George and his family lived upstairs. We got along together; both families seemed to tolerate each other. A few years later, we went to Connecticut for two weeks on a summer vacation. Wills mother had a regular beach home that she rented; we also had one; Bills brother Johnny and his family had one; so we had a little colony of our own. Johnny invited us to play cards one evening. He was about 6 feet 2 inches tall, while Im only 5 feet. He told me to put on boots as at that particular time of the year, the water rises quite a bit in teh ground and Id get all wet. Evening came and I put boots on. Johnny came for me and, guess what? The water did not rise. Oh, well, we had a good laugh. Several years later, my husband, Willaim Mullen, invited the choir from St. Patricks Cathedral in New York to the house for dinner and some singing. We had lovely music (besides some of teh church music). It went on and on until after Midnight. I expected a call from the Police Agency, but in order to get back to New York, one had to use the Ferry Boat. The last one, I think, was 4:30 am. The quartette left our house to get that boat. Wed cleaned up some of teh dishes, when we got a call. It was one of the quartette  they had missed the boat and were waiting for the next one (which would be quite early in the morning). They said they had taken a bottle of milk from our neighbors porch, but would pay for it. Of course, we were surprised and our neighbors got a goo dlaugh. We made good for the milk. The joke is that the neighbor who lived near the back of our house saw me hanging out clothes so he spoke to me. I asked if the music bothered him. He said, It was beautiful. We all loved it. He was a Piano Tuner and of course a fine musician. Will and I were relieved. Ive forgotten all the parties since that time. The children were drowing; I had four by then, so their interests came first. My Mother and Father died within three weeks of each other in 1924. In 1926, My daughter Teresa was born and my son John was born in 1928. My son Bill was a Navigation Officer in the Navy during World War II. He married in 1942 and has a son and daughter (both married). Bill has been divorced and now lives in Florida with a new wife, but seems happy with his present wife. Irene was married in 1944 to Jack Karl, who was still in Srevice at the time. He had to go to Europe for a year after they were married; it was quite sudden when he was sent overseas. Irene went to work and lived in their home, near his parents. He returned in 1945 and, during their new life, had four children: two boys and two girls. All are married now. William P. Mullen died in 1950. In 1953 my son John was killed in Korea. In 1954 my sister Irene died. So I stayed alone until 1956. When visiting my daughter Teresa, who married in 1949 and moved to Newton, I said that Id like to move up here into a little apartment near her. One day, while visiting my daughter Irene (who married in 1944 and lived in Yonkers, New York), I got a call  it was from Teresa for me, telling me of an apartment down the street from them. I told her to put a deposit on it. So I moved up to Newtoin in 1956. Later, Teresas husband, John Wright, suggested that I could move up to the present address (54 Trinity Street), if he made a small apartment for me. I moved up here and have lived here ever since (at the moment recovering from a broken hip in an accident last August). After leaving the hospital where I had been for two weeks, Teresa fixed up a room in her house, where I can stay while Im still recovering. With Gods Help, I hope to be on my own soon again. Teresa and all the family have been exceptionally kind and helpful. Ive just had a second lift put on a shoe of the injured foot and am gradually trying to get along on my own. Teresa and Jack Wright had seven children. Keith, the oldest, is a scientist and has been in Europe, coming home occasionally. Kevin, the second child, is a curator at a museum at River Edge, New Jersey. Colleen is a Hair Stylist. Pat is a Computer Operater. Tim is interested in Music and works for a music publishing firm. Pegeen works with the Board of Education on Computers. Terranc egoes to Special Education. He is good in Basket Ball and other sports and he plays piano (by ear) and does very well. Ive had lots of sadness in my life (as everyone has), but a great deal of happiness among my good children: William, Irene, and last but not least, Teresa. Ive enjoyed all kinds of music, some which I learned to like, but best of all the Opera Music which I really understood better when I came here. While Im writing this Im recovering from a Hip operation. Needless to say, the attention given me has helped me. Please God, Ill at least get back some of my courage and I hope to be able to do more for myself very soon. Now Im waiting about two marriages  the my life will have been fulfilled. Before I close this, I like to say that Teresa had made a place for me to come home to after my operation, therefore she has had the most responsibility. Irene and Billy helped with money. Irene came down when she could arrange things at home and made quite a few visits (which, of course, I appreciated). Billy, living in Florida, helped tto with money and made many phone calls. If I am successful in being able to help myself more, I intend spending a little time with Irene. Im waiting now for the Therapist to come and see how I manage walking with the built-up shoe. While Im still a bit shaky, I feel Ill make it. Not perfect, but pretty near! P. S. A special love to my dearest friend Gertrude Wright, for all the custards and favors she has shown me. I love her. Before I close this letter, I'd like to say, Teresa had made a place for me to come home to, after my operation. Therefore she has had the most responsibility. Irene and Billy helped ($). Irene came down when she could arrange things at home & also made quite a few visits (whic, of course, I appreciated. Billy, living in Florida helped too ($) & made many phone calls. If I am successful in being able to help myself more, I inted spending a little time wih Irene. I'm waitng now for the report to come to see how I manage walking with the built up shoe. A few months after, we decided to invite our NYC friends over for a "get together". Boys & gilrs etc. The folks started a "congo" one person marchs behind the other, then every once in awhile, the leader blows a whistle & everybody stops. Well! around midnight the bell rang. My husband Bill went to the door. It was a Policeman telling him neighbors were complaining aobut the noise. Bill said "Come o the back door & I'll give you "a drop othe creature" (irish Whiskey - explaination) The policeman said "Just keep it quiet". 2. A few years past & one summer we went to Connecticut for 2 wks in the summer. Will's mother had a regular beach home (rented) we too had one, Bill's brother Hohnny & his faamily had on, we had a little colony of our own. Johnny invited us to play cars one evening (he is 6 ft 2in, I am 5 ft) He told me to put on boots as at that particular time of year, the water rises quite a bit in the ground & I'd get all wet. Evening came, I put boots on, Johnny came for me and guess what? The water did not rise, oh well, we had a good laugh. 3. A more intelligent thing happened, One day March Foch (French) went thru our street (122nd St near Morningside Park) My Dad was standing at the windows he saluted him. (My Dad - as I told you was born in Alsace Lorraine, France.) Back to the silly stuff, several years laer, my husband (Bill) invited the choir from St Patrick's (NY) cathedreal to the house for dinner & some singing. We had lovely music (besides some of the church music) It went on & on until after midnight. I expected a call from the police again, but in order to get back to NYC one had to use the ferry back. The last one, I think was 4:30 am. The quarterte left our house to get that boat. We cleared up some of the dishes etc when we got a call. It was only one of the quarted. They had missed the boat & were waiting for the next one ( which would be quite early in the am. They said they had taken a bottle of milk from our neighbor's porch but would pay for it. The joke is the neighbor who lived near the back of our house saw me hanging out clothes so he spoke to me, I asked if the noise bothered him. He said "It was beautiful, We all loved it." He is our piano tuner & of course a fine musician. Well I was relieved. I've forgotton all the parties since that time. The children were growing (I had 4 by then) so their interests came first. Signed May G. Mullen, January 11, 1983. It would be interesting if other people contributed rememberances about May Mullen. Deborah Powell (Kevin Wright's wife) - I remember a story Grandma Mullen told that struck me funny. It was about a noisy neighbor who would peek out her windows all the time to watch in her in the backyard of the Leonia house. Finally Grandma Mullen carefully hung up used tea bags on a clothesline -- to really give the neighbor something to talk about. I remember Colleen saying she did a jig when told Kevin & I were getting married.